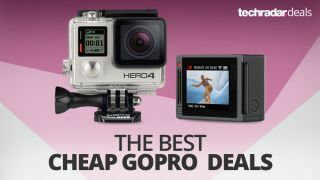 The holidays are the perfect time to pick up a camera and luckily for you Amazon has one of the hottest Cyber Monday deals we’ve seen for a GoPro Hero Session. Amazon is currently offering a GoPro Hero Session for $179 and to sweeten the pot it comes in a special holiday promotion kit with some crucial accessories. On top of the discounted action camera, the package includes a 16GB microSD card and a floating handgrip you can take with you into the water. Thus far, we’ve only seen GoPro Hero 5 Session ‘deals’ that entail gift cards instead of discounts, so this is your best way to getting GoPro’s smaller camera for less. Although the original the GoPro Hero Session doesn’t offer 4K video capture like the newest model does, it can still record clear 1,440p footage and capture slow motion action at 120fps. With the ability to also shoot 8MP still images, the Session packs all the features of the GoPro Hero 4 into a smaller package.